Week 2 of the finals is upon us and you could be in either of 2 camps; you have your feet up, beer in hand, pondering a smokie captain because you have the week off, or, you have gone into survival mode in a do or die elimination and are also pondering smoky captain as you need a miracle to make up the expected 100 points! Last week was an absolute $hit of a week. In my astute wisdom, I decided to bring in Fyfe to cover a donut in the forward line, and that worked out just great! Round 20 brought us under performing premos, injuries to popular picks (Cyril and Riewoldt*) Fyfe, Roughead and Chappy late outs and the go-to captain barely making a pass mark. Surely this week must be better? I know, we’ll trade our way out of trouble! Grant Birchall ($381,600, b/e 62) Decided to last week give us a reminder of why he has been one of the top defenders for the whole season. After a couple of quiet weeks in the 60’s, Birchall chalked up a more than handy 127 which was the 12th highest score for the week. While his consitency rating has increased to 22, his 5 round average is 87, 3 round 86, and overall average is 90. Just what we want from a ‘gun’ , a couple of quiet games, then bounces back for a big one. As Tbetta pointed out on Monday, Birchall and his other fellow hawks could be up for a rest ala GF week last year. Expect the worst, it’s likely to happen. Brendan Lee ($85,800) is one we are wishing was left til next year to get a game. Another mature age player who made a solid start to his DT career with 74 last week. Essendon are likely to name some big ins this week so he could be likely one of the first out. Dane Swan continues to exit teams who are in do or die games this week, with Jobe Watson ($510,800, b/e 97) and fellow Magpie Dayne Beams ($541,100, b/e 114) the popular replacements. Future DT king Trent Cotchin ($504,800 b/e 85) also looms as a popular replacement for those who want a point of difference with a high ceiling. As Calvin pointed out in Calvin’s Captains, he should dodge the tag of creepy Crowley which was successfully employed on Deledio last time (the week I chose him as captain,of course). A real smokie to bring in this week could be Kieran Jack ($470,000 b/e 120) who has been released from tagging duties in recent weeks and has increased his DT scoring to boot. A 3 round average of a 107 and predicted to score well against a toothless bulldogs side could be a winner. Big bird Dean Cox($445,600, b/e 87) decided to make a mockery of me (not hard) when I took the piss last week and suggested him to be a spud captain choice. 147 points and 3 votes later he was the one laughing. Cox is being traded in for my favourite ruck Jon Giles ($364,000, b/e 53) and is the 4th most popular trade this week. One player of interest for the upcoming weeks could be the human crane Sandilands ($405,500. b/e 150) if he gets a guernsey this week. Stevie J($393,500, b/e 18) Was another one to mock me last week as I said ‘ he can wait another week as historically, he doesnt score well against the eagles’. With Stevie J playing as a pure midfielder and racking up 134 points, he put that theory to bed. This week he is again against one of his worse teams in the Saints, with a high of just 77 in his last 3. There are some pros and cons to consider here; Con – Johnson’s midfield time may dimisnish with the likes of Corey, Kelly and Chapman coming back in to the team, Pro – Johnson went head to head with Pendlebury in rd 16 when they were all in the same team and racked up 137 points. Midfield role or not, you just need to get Stevie J in at that price, as he is the most logical replacement for any of the injured/missing players mentioned above. Unlikely to get rested as they need to win every game from here on in. Well that’s the rub for this week, if you are in a do or die situation with trades, pull the trigger and hope for the best. But remember though, if you have low expectations of your team, you get less disappointed! There will also be no ‘smokie’ captain pick by me this week as Beau Waters stuffed that one up. That’s the last time I use statistics to make any decisions! Hit me up on @jimbobholder on the twittersphere for questions and comments! Thanks Jimmy bob great article considering not much to talk about with the lack of trades. Need help for my last def upgrade. I’m trading Rockliff so can afford anyone, but really struggling who to pick out of Birchall, Grimes and Waters. All have tastey games this round but who do you think is the best choice this round and beyond? Your opinions would be appreciated, thanks. I think that Waters is your safest bet. I have loved Grimes, but I think Beau will be the man. I can see Birchall getting a rest (even if it is a sub ala Suckling)… so go with Beau. Thanks Warnie, I was leaning towards Waters. It’s an important trade for me as I loss last week due to Chappy doughnut when I should have pulled the trigger on Stevie, so now have to take advantage of the second chance. i think waters plays more DT friendly teams in the finals too, while Melbourne just arent very DT relevant. That image of Nick is gold. It will be used for all eternity, even long after he has retired. A week off in two leagues, a semi-final in two leagues. Very tempted to get in StevieJ at the price. I can go Williams > Lee and Elliott > S.Johnson this week and have 40K for my last trade. If I wait a week just to make sure nothing unfortunate befalls anyone in my team, I will probably still be able to do these trades but because Steven’s BE is incy-wincy and Elliott’s is 91, there will likely be no surplus cash for the final trade. Which could end up really sucking. Hold this week just in case, or get StevieJ in (who will push Cloke to the bench) to help me win my semis and make sure I’ve got a little cash to help with my last trade? If y have Cloke I would be tempted but what are your likely out come in the semis? A probable win and a probable loss – though I thought that about two games last week, and ended up winning the one I thought I’d lose, and losing the one I thought I’d win! Mm interesting if that semi means a lot to you then it would be a pretty safe bet on the other hand if you are trying to win the prelim that you had made then I would hold. 2. Trade and have a good shot at the semi but only have 1 trade left. In the end its all about how much you care about the semi IMO. This is a tough one! How much do these semis mean to you? Are they your main leagues? If so… then go all out to win. SJ is at an awesome price… hard to pass up! My only real ‘main’ league is one that I have a locked-in prelim for. The other guy that has a prelim berth already secured in that league is my opponent in one of the semis (we are in a couple of leagues together). Knocking him out of this league would provide fantastic bragging rights, but hopefully not at the expense of winning a GF against him in a couple of weeks. He hasn’t been as disciplined as me with trades though – he’d have one left tops. I’m probs gonna hold – SO tempted though! Stevie’s record against Sydney isn’t bad from memory. Stevie J’s history against SS has been mainly as a fwd. of late he’s been getting the ball himself as a mid – provided he watches where he’s going. His recent form in the NeedMore Cats has been fine. Week off this week, next week I will be using my final 2 trades and riding my luck into the GF!! All positions are set, I have decided to go with Zorko as my F7 as he scored 120 against the dogs last time they played in Melbourne. Lions v Dogs @ GABBA on Grand Final week. Reason for trading Selwood, they play SYDNEY in Grand Final!! Yep. Looks good. Obviously hold off this week and wait until selection next week… a lot can happen between now and then. If all goes to plan, they’re ripper trades! down to my Last trade and will use it this week on one of the following but not sure which one? Slightly leaning to smedts to grimes as it is my last trade i will have good cover in backline and a very strong one. Down to my Last trade and will use it this week on one of the following but not quite sure:? Smedts to Grimes (who is the best defender i dont have) which would then put Lake on the bench (good cover) with sam shaw on bench with him as well. I like the Giles to Cox trade. both are good though! Cox will get you more points. Down to my last trade and I’m in 2 semi’s which I’m predicted to win (<100). Question is who do I upgrade to and when? Option 2: hold off (hoping I win) and go Swan next week? I am in the same position having traded out Franklyn for Fyfe last week and Chappy and Swan sitting on the pine as well giving me a loss. 2 trades left and are upgrading ellis to scotland and mcdonald to jselwood, which will hopefully get me acroos the line and have great coverage on the bench (clarke, shaw, jelwood, zorko, chapman, crouch) to cover rested players. Can you tell me how to find predicted to win. Under Analyser I cannot see predicted scores for the finals. I have two trades with no money. My only weaknesses are these 3 in my forwards. Play Goodes and sideways Teloar for SJ. I have no concerns against them playing Sydney in DT Grand Final as they are down at Kardinia Park. This week – Smith to Lee (thanks Devon – it’s been real), Cloke to Sidebottom. Leaves me with 137k in the bank and one trade. Depending on injuries, etc, it’ll be either upgrading Giles or Kruezer or trading Priddis to a premo. Thoughts? 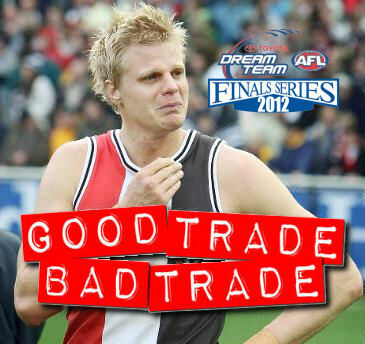 When you have only one trade left, it should be for the GF, the only trade you would make would be an injured premo, so you don’t really need all that cash…unless your teamisnt finished. I currently have Swan on the bench, with Sam Gibson covering. Obviously this week is a must win game for me. I have 2 trades left. Should I burn a trade and turn Swan into Watson, and put Gibson back on the bench. Or should I use those trades, and the $116,000 I’ve got left in the bank to upgrade an under-performing player and rely on Gibson to continue his form? The upgrade would likely be Adcock to Scotland, and save the second trade in case of injuries. Personally, I’d upgrade Adcock & cross the fingers on Gibson as the expected scoring differences between Scotland & Adcock would be greater than Watson & Gibson (watch that one come back to haunt me). Depends on your match up & expectations on a win, but Swannie may well end up a end of season unique if you’re through. I don’t see the point of a move that improves your chances of making the prelim, and at the same time reduces your chances of winning it. Absolutely don’t trade Swan. Whether or not to use two trades to upgrade a player is tougher. If you are only in one league I would definitely go for it. And I’d probably throw the other one at the prelim and hope for the best in the GF. Should i trade bugg out for matt de boer subing carrazzo into back line, de boer is the best i can afford is deboer followed by black, goodes and lewis jetta. i have 1 trade left with 21,000 in the bank so upgrading bugg was always going to be hard. After Treloar and Aaron Hall are out I need to upgrade Haynes of GWS – thinking of Wright of Adelaide. Thoughts? Any other suggestions?